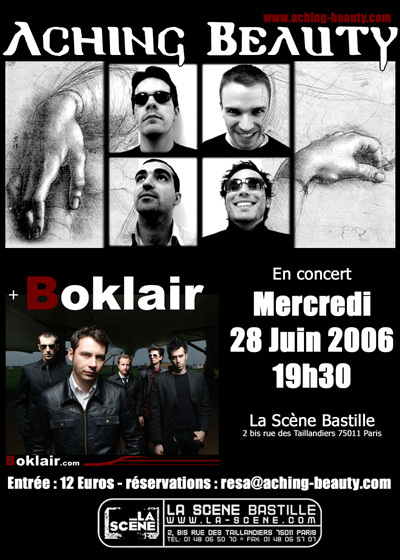 [2007-06-23] : Listen to « Virtuelle Amnésie » , Aching Beauty's new single ! [2006-12-05] : Aching Beauty record their new single «Virtuelle Amnésie» which will be released on the compilation «Underground Rising» , edited by CheapNoiz Records. Release planed for december 2006. [2006-08-25] : Aching Beauty's chat is back ! Get connected and discuss online with the band and the fans. [2006-06-07] : Aching Beauty back on stage after a year and a half. New line up, new album being composed, new musical evolutions. Come and check that the 28th June. [2006-06-04] : Aching Beauty is preparing for the recording of the second album. [2006-02-04] : Aching Beauty is changing. Discover the new face of the band. [2005-12-05] : Aching Beauty is changing. Welcome on our new website. [2005-09-12] : Free video archives ! This week : video from the ENSAI gala, march 2002 : Dream Theater cover "Voices". (95 Mo) Enjoy ! [2005-09-01] : Aching Beauty proudly offers you to download the MP3 "Pairsonality" - from the latest album "L'Ultima Ora" ! [2005-05-10] : More reviews for L'Ultima Ora's : in the press, online and on air on radio ! [2005-01-17] : Aching Beauty appears on the compilation "Into a Heavy Circle" with the single "Pairsonality". [2002-11-07] : Find out an excerpt of Aching Beauty's new song of : L'Ultima Ora. [2002-10-31] : The recording of the new album has actually started last week-end : In two days, Antoine has finished every track of drums. Next will be Fabien on keyboards. [2002-09-08] : Waiting for the release of our album, Aldric and Fabien are working together on Guitar-Keyboard interactions. You can download samples of these improvisations. [2002-06-29] : After the past shows, Aching Beauty starts the recording of their first album. We'll keep you informed of the record process... 'step by step' ! [2002-04-23] : Find all the trablatures transcribed by 20.100 for the 'John Myung style analysis' published in Your Majesty #33. [2002-03-30] : The website has been freshened up entirely. [2001-12-23] : For Christmas, Aching Beauty offers you to download freely the track 'The Hundredth Name' from the Demo 'One More Step'. Available in MP3. [2001-12-05] : This is official ! Aching Beauty's brand new Demo is now released !